Well, after another weekend in our soon-to-be home city and spending Sunday afternoon driving around looking for houses, the reality of this move is beginning to set in. If you hadn't heard, last week our house went under contract! It was only on the market for a little over a month and in this economy we are MORE than thrilled with the outcome. Praise the Lord! We are just waiting for the inspection to go through and we should be home free. It looks like we'll be in Raleigh before the close of October! Wow, it's all happening so quickly! I'm beginning to think about the people we'll miss, the friendships we've made, the yard we'll no longer have, the house we're about to sell, the different stores I'll have to learn to navigate with the coupon world=), moving with 3 kids...wow, a lot of changes. I'm so excited at the same time. So many emotions at one time. So now we are concentrating on finding a place to live. It has been fun to look at different houses. I must admit that I get a little obsessed with the ones I like and it's all I can think about until it is no longer an option, for some reason or another. I start imaging where our bed will be and where to put a couch and a good place for a Christmas tree. Come on, you know you do it too;) You HAVE to have a good place for a Christmas tree! So, it's really happening! And SOON! Lord, I give all my anxieties to you. Give us wisdom as we seek your will and a peace in our hearts during this unstable, yet exciting time. us to descend to TRUE greatness." I've realized just how selfish, impatient and self-centered I truly am. It is a very humbling book. I have really been asking God to search me and show me any selfish way in me to work on and to show me areas where I can be a servant...and wouldn't you know He started showing me right away! But instead I felt a heavenly nudge to go get the door, so I pulled myself together but it was not with a "happy heart" like I so often instruct my own children to do. I opened the door to a dear lady friend who clearly needed to talk to someone and if you only knew this lady you'd know that it would mean the world to her for me to stop whatever I was doing and sit and talk with her. But that isn't what I did, inside anyway. I stood there with a bad attitude trying to smile through my teeth and act interested in what she was saying. She'll never know the difference. I put on a good front. But is that what God had led me to the door to do? No, he has called me to think of others first and to put other's needs ahead of my own. What had I JUST read about for crying out loud?! The whole time we were standing there talking all I could think about was ending the conversation and getting my much-needed (wanted) shower. You can check out this blog post I read the very next day about interruptions in our day. Sometimes those are God-given appointments that are well-worth the interruption. Are You Really Going Out Looking Like That? I'd show you a picture of my chosen attire but I then I would feel a little too vulnerable! It's confession time ladies. How many of you have been known to run out in public looking like you just woke up or just hopped off the treadmill? Check out Josh's post for today if you want a little chuckle today=) I couldn't help but share it with ya'll! It seems as though we've been flooded with bills lately for doctors visits for ALL 5 of us and the birth of Micaiah. It's a little overwhelming but I try my very best to keep up with all the figures to make sure we aren't overpaying or duplicating a payment which has already been paid by our insurance, which so commonly happens. Today, as I was trying to get caught up on some bill paying after being out of town, I came across 3 separate hospital bills. I pulled out my pile of "explanation of benefits" from our insurance company and cross-referenced all the figures to make sure they matched up. You know, I used to just throw those things away or just file them away, unopened, but I've since learned my lesson. One of the bills that I had received did not have an explanation of benefits to go with it so I called them up and they hadn't even submitted the claim. She said "We do the hearing test in the hospital for newborns and we never get insurance paperwork while we are in there." Yes, you read that correctly, they NEVER even get paperwork in the hospital while they are in there, it is up to us to make sure we call them, give them our information, and then ask them to file it with our insurance. If we don't, then we are stuck paying in full without even knowing it for something that is probably covered by our insurance. That one call may potentially save us a couple hundred dollars. The other 2 bills had those explanation of benefits to go along with them and the amounts were correct. Here is what I do with each bill, large or small. I call and say "Yes, my name is Tasha Via and I just received a bill in the mail. I was wondering if you could check my account for me to see if I am eligible for any additional discounts if I am willing to pay in full today." 1 of the bills didn't qualify, but 1 did. In fact they gave me a 20% discount off of my total which saved us about $100! Josh: "Well, you just need to sit there for another minute to make sure. I don't like to wipe twice." We have had a busy couple of weeks. All last week Josh was doing ministry with his dad near Fredricksburg, VA. The kids and I drove up to VA with him and spent the week with his mom. We had a blast! Janet went all out for "B" week and helped me with the kid's school. They painted "B"ird houses and went on a "B" walk looking for things that started with "B". We ate spaghetti and meat"B"alls and "B"ean burritos. It think they've got "B" down;) I got a chance to catch up on some sleep and just spend some one-on-one time with Micaiah. It was such a blessing! After Josh got back from Fredricksburg we headed down to New Sandy Creek Baptist Church to lead worship for their annual women's conference. The speaker was Luann Prater from Proverbs 31 Ministries. God really moved among the ladies who attended. We also got to spend some quality time with "Grammy and Papa" while at the conference. The pastor and his family, whom we love so dearly, have become grandparents to our kids and family to us and we always enjoy our time with them. I can't believe I didn't get a single picture! To say that Rainy and Zeke were SAD about leaving is an understatement! We got home on Saturday night and boy were we all tired but we weren't done yet. We woke up early and headed to Pageland, SC where we lead worship for South Pointe Fellowship. It was so good to be back there and see some dear friends that we hadn't seen in over a year. Thanks for having us back! Well, today was different after a nice overcast sky brought us some rain and I relaxed a little bit. 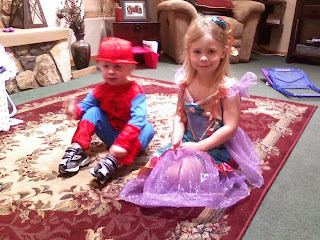 The kids have been pulling things out of their playroom all day and they have taken over the house. The thing is, it didn't even bother me. It actually felt good! The funnest things to play with are the things where you can use your imagination! Anyway, he found a bottle of gatorade and Josh started calling it "spider juice". When the bottle was empty he started asking for more "spider juice". I explained to him that if he drank too much it could make his tummy hurt. Me: "Zeke, what did mommy say about having more "spider juice"? Zeke: "That we had to wait to have some more." Me: "And why does mommy want you to wait to drink more "spider juice"? Zeke: "Because I might turn into a big spider web." Me: "Uh...yeah...and you might get a tummy ache too." HA! Areyna helping feed Micaiah for the first time. Areyna just hates her job as a helper and big sister to Micaiah, can't you tell? :) Actually, if you could hear her giggling with delight as she fed Cai for the first time you couldn't help but smile yourself. Her reaction was priceless! Josh and I have been endlessly cleaning out our house. You know, those dark places that lurk in the corners of closets, that sit under the bed and that lie, forgotten, up in the attic. We've been de-personalizing our house which, I have found, to be one of the hardest things to do in a home I've spent hours making into a personalized haven for my family. But, I digress...we have taken countless items and numerous trash bags FULL of "stuff" to the goodwill and still have TONS OF STUFF! All in the name of selling our house. Several questions have come to mind that have helped in the tossing stage during this moving process. 1- Why in the world did I ever buy this? 2- Why do I still have this? 3- How many times do I really wear this? 4- If this is sitting in our attic, unused, then why do we still have it? 5- Do I REALLY need this? 6- Wait, don't I already have one of those? Now don't get me wrong. I am not a pack-rat by any means. I am constantly purging our house of unused and unneeded items, to a point where it is almost comical to Josh, but there are always those things that I continue to hang on to. It has been such a good feeling to get rid of even more things. It feels even better when we can give our stuff to other people who can use it! It's made me want to travel light and to have a loose hold on my stuff, which is only "stuff" anyway, so that I will always be willing to go where He sends us and do as He sees fit. I find that the more stuff that I have, the harder it is to let go of it. What do you have that you cannot let go of? What questions do you ask yourself when looking to get rid of stuff? Well, I'm not home this time to take part in HT triples until the very end so I'm not sure if I'll venture out to find those deals or not. But, if you are interested there are GREAT deals for FREE or SUPER CHEAP starting tomorrow! Click HERE and then HERE to get a list of the best deals with coupon match-ups. Zeke loves to play good guy mean/bad guy. The only catch is that he gets scared at the same time so we figured out that if he is the mean/bad guy WITH his daddy then he enjoys it much better...plus, have you ever seen such a cute mean guy before?! On Sunday morning I woke up late and Micaiah woke up ON TIME and I HAD to get a shower. 6am band practice was WAY TOO EARLY last weekend! Anyway, I asked Josh to give Micaiah a bottle while he prepared for the morning. Little did I know that Zeke would wet the bed and Josh would try to pack the car ALL at the same time, HA! A dad's gotta learn to improvise right?! Fun Facts For Friday - This One Has a Free mp3! 1- I finally got a couple good pictures of all 3 of the kids this week! until we started and then she didn't want it to be over. 4- Micaiah's umbilical cord finally fell off on Wednesday afternoon so you better believe he got his first bath. It didn't last long, but boy does he smell sweet! 5- My awesome husband wrote another song called "Broken" and he's gonna let you download it for free HERE! If you just want to listen to it you can go HERE. If you look closely you can see the "dog with dwips"
For some reason Zeke is fascinated by this picture and, no matter which part of the Bible we are in for our Family Bible "Commotions", as we so often call our family devotion time together, Zeke ALWAYS asks for us to find him the "dog with the dwips". 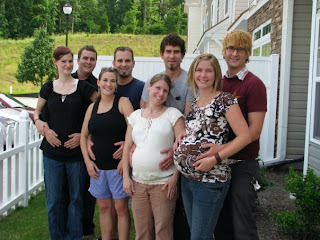 While I was pregnant with Micaiah all of Josh's brother's wives were pregnant too. It was the coolest thing. These pictures were taken the week before Father's Day. Let's just say that the Via Christmas picture is going to need a WIDE lense after all these new additions this year! 4- We are beginning to see glimpses of personality like smiles and baby "coos"
5- Has mild colic. I wouldn't say it's that bad because he went 2 full days without a screaming episode but he still has those tendencies. Nothing soothes this baby like a good cuddle. 7- Not too fond of the swing but he has spent a few wake times in it this week while I have packed some boxes. 8- Still has his umbilical cord attached. I'm so ready to give my baby a bath! 10- Because of this new sweet addition to the family my new middle name is "LATE". I cannot seem to get anywhere on time! I can no longer even appear to have it all together, HA! I am finishing up a book called Satisfy My Thirsty Soul by Linda Dillow. This weeks focus is on encounters with God. She urges us to schedule times with the Lord. This not only makes room for God in our busy day but it opens up the door to "Surprise Encounters" with our Heavenly Father. Throughout the chapter she highlights times in her life where she has found herself in a surprise encounter with God. They are such sweet testimonies of God's presence. It got me thinking of times in my life where God was undoubtedly present at a particular time. One being just a month ago. Right after Micaiah was born the doctors brought him up and put him on my chest. While I laid there cuddling my newborn son all I could do was praise God. Praise Him for his blessing of children. Praise Him for my sweet, growing family. Praise Him for a healthy baby. Praise Him for the end of labor pains. Just praise Him. He was all I could think about. That night, and the following night, in the hospital I found myself laying in bed, awake, and not being able to stop smiling and feeling so full of thanksgiving. I guess after the emotions that the delivery put me through I was left thinking about the sweet little babies that never make it into this world, ours included, whom the Lord created but that we'll never be able to meet this side of heaven. Realizing the gift that I was holding in my arms, I was overwhelmed by God's goodness. It was the second night in the hospital that I was brought to tears by a presence in the room. A sweet presence. I knew God was there and very close. I could feel Him. All I could do was lay there and bask in His presence. What a sweet encounter that was. Have you ever had a surprise encounter with God? 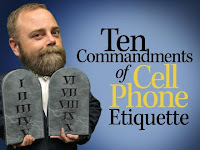 I was talking with my brother-in-law a while back about cell phone etiquette. He was being ragged on because he wouldn't return his missed calls. The caller never left a message, he was just expecting Jonathan to see that he had missed the call and make the call back. What do you think? If someone calls you but doesn't leave a message are you obligated to make the call back? I don't think so. The ball has not technically been passed on if the caller doesn't leave a message asking you to return the call. I have a few friends who will initiate a text conversation. When I get a text I try to respond right away, so naturally I return their text but they will wait hours, and sometimes the next day, until they actually text back to finish the conversation that they initiated. So, if you are the one that initiates the text conversation shouldn't you be responsible to see it through until completion? but you better believe Cinderella Barbie did! 1:02pm - find my phone so I can make a couple of phone calls while on the walk. notice that I missed the call from the agency. 1:05 - 1:39pm - frantically straighten up the room, sweep the floors, store unnecessary items around the house, pick up the yard. Areyna is a HUGE help with their rooms! My sweet Micaiah has been such a blessing to our growing family. I have learned so much during this first month of being a mommy to 3 beautiful children. Just for the record, I am a schedule momma. It is a fact that children need a schedule and actually tend to put themselves on their own schedule. Also, knowing my child's next move is a MUST as a mom on the road with a ministry to run. So, this may come as a shock to some of you who know me. We've tried to just let him cry-it-out knowing from past experience that sometimes it just takes a good cry for some babies to get into a comfortable sleep, but Micaiah is a slow learner in this department=) and he would go all night long if we would let him I'm afraid. There IS one thing that he LOVES. He loves to be held. He is a cuddler and by that I mean after a good 10 min. of crying if we go in there and pick him up he is asleep in our arms within 1 min., no exaggeration. So, after all the normal doubts that a mother has when her child is crying I have come to a realization...it won't always be like this. I have the answer to all your questions about the best way to shed those extra pounds after baby. Seriously though, what do YOU do to lose those last few baby pounds? *As if I really need to explain the obscene amount of ice cream in my freezer...we've had my parents and my in-laws here for Cai's birth and they ALL know how much I love ice cream;) Besides, who can resist all those free or super cheap ice cream deals that the grocery stores have going on lately! After almost a month of not picking up my violin I dove in full-force this past weekend at our new home church. It was so cool being there knowing that this is our new church family. Josh has been more than patient with me (man, I love my boss) as I get back into the swing of things after Micaiah's arrival. He told me to take another week off and just get used to traveling with 3. I really did appreciate his sensitivity, knowing that this would be a new challenge, but I finally felt ready to play again so I just took the plunge and decided to play too. Rehearsal Sunday morning went well. Areyna was a huge help keeping Micaiah happy and Zeke played along with his electric guitar making for a pretty uneventful rehearsal, which is a good thing. Micaiah made it through his first Sunday morning in his nursery. We've been to church already but I hadn't been playing so he stayed with me in the service. The workers loved him and he did great! Areyna LOVED her class and had a blast having her cousin with her! Don't worry we're still going to be doing what we do, just packing up our car from a different driveway to head out to lead worship. 1- We'll be closer to all of our family. All of Josh's brothers live in the Raleigh area and my siblings are up in the DC area so we'll have that family support that we've not had here in Charlotte. 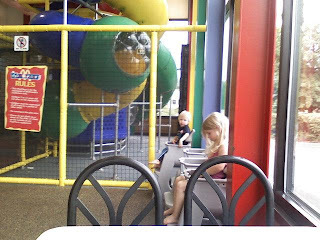 It will be nice to have Rainy and Zeke grow up closer to their cousins that they love so much. 2-You know that feeling of driving into a town and just "feeling" like that is home? Well, that is how the Raleigh area feels for us. We lived there for 4 years before moving here to Charlotte and we've always missed it. we decided that some familiarity would be good for Zeke. 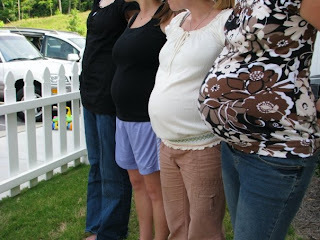 4- We have been praying about my involvement in traveling now, with 3 children. The church stability will be so important because I won't be traveling ALL the time. We are going to be much more careful about the kids and what they need, as far as time at home etc., so being close to family in and out of church will be a huge blessing. 5- Our family can help with the kids when we need to travel without them. 6- I like new houses and rearranging, don't you? You can expect to see some crazy posts coming out of this one!